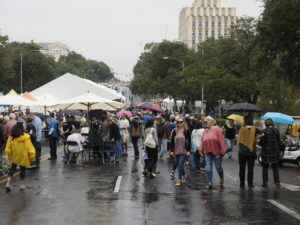 We had a bit of rain for the Texas Book Festival but luckily it wasn’t too bad and I had a great time. My first session was going to check out a panel of writers talking about contemporary Latin American literature. The schedule had a misprint so when I got to the tent there was another author still presenting. I figured, well, I’ll check this out even it if was a children’s book author. I’m glad I stayed. Yuyi Morales was a delight when she was reading from her book Rudas: Ninos Horrendous Hermanitas. The Hermanitas are lucha queens. The kids in the audience really seemed to enjoy the story and I couldn’t help but laugh a few times. Really cute. 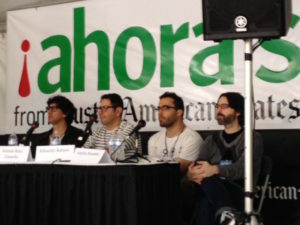 Next was the Latin American authors panel. Presenting were Mauro Javier Cardenas, Antonio Ruiz-Camacho, Eduardo Rabasa and Andres Neuman. I have not read any of their books but after hearing their discussion on story creation and Latin American identity in the new world I will definitely be looking for their books. Actually when I got home from the festival I started looking for their books and am just now deciding which one to get first. The next presentation I went to was with Kelly Luce and Jung Yun. Two authors who talked about the dark side of human nature. How they dealt with creating violent scenes and of course, what is next in store for them. I have not read these authors either although I do have Jung Yun’s book on my shelf (Shelter). Unfortunately the next discussion I wanted to go to was closed as it was filled to capacity. Ugh. This happened to me last year too. Which is why I wish the Book Festival was held somewhere else but that’s a rant for another day. I spent some time browsing the vendor tents and I picked up two books from Malvern Books. This is an indie bookstore here in town which I just haven’t had the chance to visit. After visiting them at the Book Festival though I definitely plan to check out the store soon. The books i got were Rock Crystal by Adalbert Stifter, which could be a great choice for the German Literature challenge, and Best of Contemporary Mexican Fiction. Oh and last but not least, I found out that San Antonio also has a literary festival in the Spring. Hmm, I see a little road trip in my future! I hope you guys had a great weekend. Did you buy any books this weekend? What did you get? What a great event, even if it was a little soggy. Wish we had something like that around here. Shelter is much darker than what I usually read, but it will certainly be among my favorite this year. Hope you get a chance to read it . You and Sam Sattler are enjoying the festival–so I get to hear about two different choices of sessions! Sounds like a great time even with a little rain. Too bad you didn’t get into the one presentation. I hope it wasn’t the one you were looking forward to most! Joann@Lakeside Musing – I do want to read Shelter definitely! I love hearing the authors talk about books. Makes you appreciate the book even more doesn’t it. Jenclair – Oh how fun! I wish I had gone to more sessions but I was actually worn out by the time I came home. Hopefully next year I’ll make it to both days of the event. Stefanie – I was so bummed out although not as much as last year when I missed Margaret Atwood. I’m still not over that one!